Thorson led the final five circuits of the 20-lap A-main, passing Karsyn Elledge in turn one on a late-race restart and powering away to victory by three-quarters of a second over week two winner Tom Hubert after two more cautions gave the field one more chance at him. Elledge and opening night winner Mitchell led the field to the green flag at the start, and it was Mitchell who escaped from the outside lane to lead early on. By lap five, he had opened up an eight kart-length lead over Elledge as NASCAR Sprint Cup Series star Kyle Larson climbed from row four into the top five by the seventh round. Less than two minutes were gone by the time the field reached the halfway point, and the green flag conditions were enough for Mitchell to build a three-second gap that it appeared he would never relinquish – until the five to go mark, when Zach Wolfe and Brandon Knupp tangled in turn four right in front of the leader, collecting Mitchell and ending his hopes at victory in the process. In light of the crash, Thorson was able to take advantage. He blitzed to the inside of Elledge on the restart, and as Elledge dropped back off turn two, she got sideways and spun into the pack. The ensuing calamity collected Nick Hoffman, Dylan Smith and Chaz Woodward on the backstretch and set up another restart with Thorson out front ahead of week two winner Tom Hubert and Larson. Larson’s night would end two laps later, as he blew the motor in his No. 1K ParkerStore entry with three laps to go, drawing the night’s final caution flag. Though Hubert set up on Thorson’s tail tank for the final dash to the finish, he was unable to capitalize and had to settle for a runner up finish. Kevin Thomas Jr., running as a teammate to Thorson and making his first ever start in a mini-outlaw kart, rounded out the podium in third ahead of Buddy Wise and Clark Houston. NASCAR on NBC and SPEED SPORT TV personality Derek Pernesiglio was sixth. Hoffman kicked off the night by setting quick time in two-lap qualifying around the one-sixth mile dirt oval, with a lap of 10.0806 seconds that was nearly two tenths faster than the rest of the 25 car field. The Millbridge veteran followed that up with a win in the first heat, and was joined by Hubert and Thorson as heat race winners in their respective eight-lap runs. Chaz Woodward wired the 12-lap B-main to lead the trasfers into the “Big Show”. Carson Kvapil in victory lane. Carson Kvapil wired a non-stop feature for the 250cc Intermediate class, surging to the lead from the inside on the opening lap and pulling out to a whopping 6.149 second advantage by the time the twin checkers flew over the field. Alex Bodine was second, followed by Gage Painter, Ryan Israel and Ty Gibbs – the grandson of three-time Super Bowl winning coach and four-time NASCAR Sprint Cup Series champion owner Joe Gibbs. In the Box Stock class, Brent Crews took the lead away from Wyatt Underwood just before the halfway point of the 20-lap A-main and ultimately held off week two winner Hunter Kohn to collect his first win of the 2016 Wednesday weekly series. Caden Kvapil, Zac Israel and Tyler Letarte were the balance of the top five, while Underwood ended up in the outside wall after late-race contact with Gavin Boschele and dropped to 14th in the final rundown. Nathan Meendering passed polesitter Jacob Monsour on the second lap of the 15-lap Beginner Box Stock main event, but when the pair came together and crashed in turn two with four laps complete, it opened the door for Tyler Dolack to take advantage. Though Meendering charged from the back of the field with the aid of two caution flags inside the final five laps, Dolack was able to hang on for his first win of the 2016 season and first career feature win at Millbridge Speedway. Meendering finished second after contact with Kynser Flynn in the final corner, with Danny Dyszelski, Monsour and Ethan Burdett rounding out the top five. Flynn was relegated to ninth. Millbridge Speedway returns to action on April 9 for their first Saturday show of the 2016 season, featuring the rising stars of short track racing in the fast and fearless winged mini-outlaw karts. For more information on the fast one-sixth mile oval, visit www.millbridgespeedway.com. 500cc Open Class Qualifying (best of two laps): 1. #2 – Nick Hoffman, 10.0806 seconds; 2. #19 – Ethan Mitchell, 10.2607; 3. #71 – Tanner Thorson, 10.3102; 4. #94W – Buddy Wise, 10.3438; 5. #1K – Kyle Larson, 10.3525; 6. #15G – Tanner Gray, 10.3576; 7. #03 – Dylan Smith, 10.3610; 8. #30 – Tom Hubert, 10.3661; 9. #81 – Jimmy Elledge, 10.3920; 10. #73 – Chad Bush, 10.4323; 11. #28 – Derek Pernesiglio, 10.4533; 12. #3 – Karsyn Elledge, 10.4638; 13. #25 – Zach Wolfe, 10.4656; 14. #08 – Devin Boutot, 10.4664; 15. #51 – Kevin Thomas Jr., 10.4760; 16. #7C – Tony Mangini, 10.4959; 17. #71 – Adam Welch, 10.5131; 18. #6 – Clark Houston, 10.5405; 19. #02 – Branson Dils, 10.5735; 20. #27 – Mark Pollardi, 10.5752; 21. #2C – Tim Mangini, 10.6589; 22. #4 – Dean Bush, 10.6704; 23. #78 – Brandon Knupp, 10.8130; 24. #51 – Chaz Woodward, 10.7446; 25. #98 – Brandon Dean, NT (spun on both laps). Beginner Box Stock Heat #1 (8 laps): 1. Jacob Monsour, 2. Tyler Dolack, 3. Kynser Flynn, 4. Danny Dyszelski, 5. Dallas Griggs. Beginner Box Stock Heat #2 (8 laps): 1. Nathan Meendering, 2. Matthew Francis, 3. Ethan Burdett, 4. Taylor Elenz, 5. Brett Harrison. Box Stock Heat #1 (8 laps): 1. Zac Israel, 2. Tyler Letarte, Caden Kvapil, 4. Tyler Beckham, 5. Joey Robinson, 6. Nick Huntley, 7. Hunter Kohn, 8. Tiffany Claridge. Box Stock Heat #2 (8 laps): 1. Wyatt Underwood, 2. Eli Adams, 3. Gavin Boschele, 4. Eli Adams, 5. Aiden Turner, 6. Skylar Chaney, 7. Preston Huntley. 250cc Intermediate Class Heat #1 (8 laps): 1. Carson Kvapil, 2. Tucker Scanlon, 3. Ty Gibbs, 4. Cole Hilton, 5. Taylor Gray, 6. Olivia Peeney. 250cc Intermediate Class Heat #2 (8 lvaps): 1. Alex Bodine, 2. Gage Painter, 3. Adam Welch, 4. Ryan Israel, 5. Kyle Campbell. 500cc Open Class Heat #1 (8 laps): 1. Nick Hoffman, 2. Dylan Smith, 3. Chad Bush, 4. Buddy Wise, 5. Zach Wolfe, 6. Tony Mangini, 7. Branson Dils, 8. Dean Bush, 9. Brandon Dean. 500cc Open Class Heat #2 (8 laps): 1. Tom Hubert, 2. Ethan Mitchell, 3. Kyle Larson, 4. Derek Pernesiglio, 5. Chaz Woodward, 6. Mark Pollardi, 7. Devin Boutot, 8. Adam Welch. 500cc Open Class Heat #3 (8 laps): 1. Tanner Thorson, 2. Karsyn Elledge, 3. Kevin Thomas Jr., 4. Clark Houston, 5. Brandon Knupp, 6. Tanner Gray, 7. Jimmy Elledge, 8. Tim Mangini. 500cc Open Class B-Feature (12 laps, four transfer): 1. Chaz Woodward, 2. Zach Wolfe, 3. Brandon Knupp, 4. Mark Pollardi, 5. Adam Welch, 6. Dean Bush, 7. Tony Mangini, 8. Branson Dils, 9. Devin Boutot, 10. Jimmy Elledge, 11. Brandon Dean, 12. Tanner Gray (DNS). Beginner Box Stock A-Feature (15 laps): 1. Tyler Dolack, 2. Nathan Meendering, 3. Danny Dyszelski, 4. Jacob Monsour, 5. Ethan Burdett, 6. Matthew Francis, 7. Brett Harrison, 8. Dallas Griggs, 9. Kynser Flynn, 10. Taylor Elenz. Box Stock A-Feature (20 laps): 1. Brent Crews, 2. Hunter Kohn, 3. Caden Kvapil, 4. Zac Israel, 5. Tyler Letarte, 6. Nick Huntley, 7. Tyler Beckham, 8. Joey Robinson, 9. Skylar Chaney, 10. Gavin Boschele, 11. Preston Huntley, 12. Tiffany Claridge, 13. Aiden Turner, 14. Wyatt Underwood, 15. Eli Adams. 500cc Open Class A-Feature (20 laps): 1. 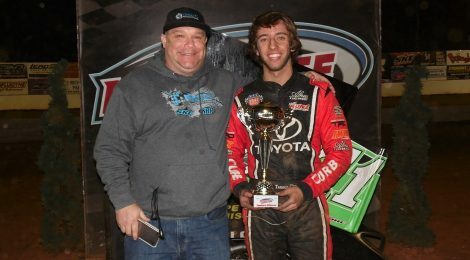 Tanner Thorson, 2. Tom Hubert, 3. Kevin Thomas Jr., 4. Buddy Wise, 5. Clark Houston, 6. Derek Pernesiglio, 7. Ethan Mitchell, 8. Nick Hoffman, 9. Chaz Woodward, 10. Chad Bush, 11. Kyle Larson, 12. Karsyn Elledge, 13. Dylan Smith, 14. Zach Wolfe, 15. Brandon Knupp, 16. Mark Pollardi, 17. Tim Mangini (DNS).